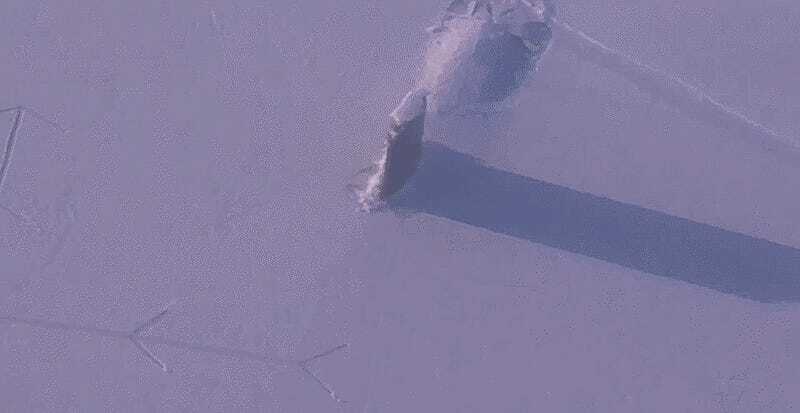 This footage of the Los Angeles Class fast attack nuclear submarine USS Hartford breaking through the ice in the Arctic Circle is unbelievably awesome. I’ve never seen aerial imagery of such an operation, but it looks like the earth is hatching a nuclear submarine. The Hartford surfaced near the Navy’s newly-constructed ice camp dubbed “Camp Sargo.” The camp is named after the first U.S. Navy submarine to conduct a Bering Strait transit during the winter years some 56 years ago. The camp consists of a command center, cold-weather shelters and other basic infrastructure to support more than 70 personnel at a time. All this is part of Ice Exercise (ICEX) 2016, a set of international drills that the Navy intends to use for scientific research, test and evaluation of operational capabilities tailored to the arctic region. A similar submarine, the USS Hampton, also surfaced nearby as part of the exercise. It will last five weeks. The arctic is likely to become a major strategic flashpoint in the future. With large reductions in ice due to climate change new shipping channels will likely emerge in the region and there is thought to also be largely untapped energy deposits in the area. With this in mind, Russia has been prepping for arctic warfare over the last few years, and now the U.S. and NATO are catching up.